Photo: Children at our home have experienced complete life transformation and rank among the top students at their school. April 21, 2017. Today we are thankful to share an update about the history and recent successes of our orphan home in Nepal. Our Nepal director, Bimal, was born near Mt. Everest Base Camp and has decades of experience in trekking and navigating mountain villages that can only be reached by foot. It was during his travels in the 1990's and 2000's that he encountered many children who were malnourished and neglected due to the loss or disability of such children's parents. So God had begun to plant the seeds in his heart to start an orphan home in the nation's capital of Kathmandu. But he had no idea how he would ever embark on such an endeavor. It was in October of 2007 that Bimal found Peace Gospel's website and sent an email which our Executive Director, Kirby Trapolino, received. Delighted to receive an email from Nepal, a place Kirby had always dreamed of visiting, he immediately replied desiring to know more of Bimal's vision to reach at-risk children in Nepal. They began a correspondence, and Kirby was able to encourage and support Bimal in his desire to start an orphan home, having had a lot of experience in pioneering native-led orphan care programs in another part of South Asia since 1993. In 2008 Peace Gospel entered into a formal partnership with Bimal and the new foundation he established in Nepal. It was at that time that funding was provided for Bimal and his wife, Pushpa, to establish the home. They then adopted five orphans in early 2009 who were in dire need of rescue from extremely impoverished conditions in faraway mountain villages. In this way, the orphan home was established with oversight, funding, and guidance offered by Peace Gospel. We are happy to report that 8 years later we now have 21 children living in our orphan home, loved and cared for by Bimal, his wife, and 4 faithful staff members — a girls’ dorm mother, a boys’ dorm mother, and 2 women who cook for the children and clean the orphan home. Our children are very blessed because most of them were brought to our orphan home from remote parts of Nepal where there was no electricity, no roads, no hospitals, no markets, and no access to any modern facilities. At our orphan home, the children are now receiving a quality education, and their emotional, spiritual, nutritional, and medical needs are being fulfilled, which would not have been possible if they had continued to live in their old villages. In other good news, all 21 of our orphans started back to school today after the success of their last semester where they completed their final exams with excellent scores. One child was promoted to 1st grade, one child was promoted to 3rd grade, two children were promoted to 4th grade, seven children were promoted to 5th grade, two children were promoted to 6th grade, four children were promoted to 7th grade, two children were promoted to 8th grade, and three children were promoted to 10th grade. 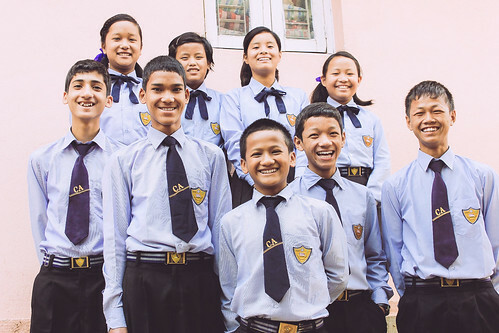 This year our children are studying math, science, their native Nepali language, English, social studies, and computer skills. With your support, we have provided the children with new school uniforms and shoes, new textbooks and notebooks, new school bags, and coverage of their tuition fees. Focusing our efforts on keeping the children in school is a key component in breaking the cycle of extreme poverty, and gives them great hope and an opportunity to change their lives. We are grateful for your prayers and generous donations which greatly encourage Bimal and his native team in their hard work to rehabilitate these children and prepare them for a joyful, successful future.